Keller Williams (KW), a Texas-based company, has just released its quarterly report for the third quarter of 2018 and the figures confirm the positive impact of worldwide growth over the course of this year. "Our consultants are focused on competing like never before," "They are leveraging our technology by strengthening our market position and gaining more territory, even in the midst of the market change we are now seeing." Since the launch of its Growth Initiative in April 2011, Keller Williams has maintained an exponential growth and in September 2018, KW adds more than 100,000 real estate consultants than in 2011, in the United States and Canada alone. 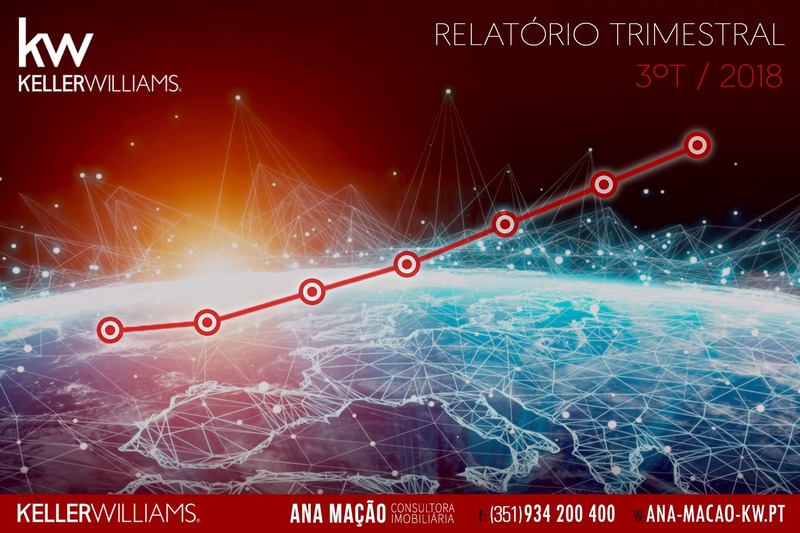 This growth further strengthens the company as the largest brand of real estate franchising in the world, in number of consultants, counting on more than 980 Market Centers and 190 thousand associates. The franchise brand is also the No. 1 in number of transactions and in sales volume, in the United States of America. As president and CEO of Keller Williams, John Davis leads the Keller Williams Growth Initiative. This innovative business leadership program empowers leadership teams with unique systems, models and tools to deliver predictable and sustainable growth in both market penetration and profit generation. The Growth Initiative was first planned, tested and proven by John Davis through the transformation of a Market Center into a franchisee in Southlake-Texas, which at the time had about $ 500,000 in debt, one of the most profitable in the Keller Williams universe . Based on this success John Davis immediately began the process of replicating this system in other company's Market Centers, generating similar results with rapid and substantial gains in market penetration and profit generated. The Growth Initiative has become the foundation of all management and training and is reinforced by Davis' own weekly coaching conferences throughout the company, in which the leadership teams and John Davis work together to broaden the results. We are very proud of our real estate consultants, Market Makers and managers of the 100,000 new members of the Keller Williams family, added since the beginning of the Growth Initiative in 2011. And we're just getting started! This level of growth contributes to our culture of sharing and plays an important role in investing in new technologies. Our third quarter was historic; we launched a new tool, Market Snaps, which provided the consultant and the consumer with incredible value through App Kelle, our personal assistant based in Artificial Intelligence. We also announced the strategic acquisition of the Smarter Agent and two important technology partnerships that keep us in line with the planned technology and business strategy. In the third quarter of 2018 alone, 60,228 consultants downloaded Kelle, a commercial artificial intelligence partner, available in the US and Canada. On September 30, 135,763 consultants installed Kelle YTD. App Kelle won the "Best Real Estate Technology of 2018" award given by Inman News in July 2018. Only in the 3Q of 2018 were Kelle sent 9,712 real estate suggestions , representing 2.3 billion dollars in sales volume. KEL has launched Kelle Market Snaps , a new Kelle feature that allows agents to get hyperlocal market reports with voice or text commands via the Kelle App. 561,219 Market Snaps were shared during the third quarter of 2018. Keller Williams has released a number of new features from Kelle . Keller Williams acquired the Smarter Agent , the most used SaaS ( Software as a Service) mobile platform in the real estate market. The brand announced the major R & D partnerships in technology with KUNGFU.AI and CognitiveScale . KW Labs , KW 's innovation center, won the inaugural Hackathon of the National Association of REALTORS®. Keller Williams has expanded globally to Belgium , Luxembourg and Cambodia . Entrepreneur magazine named Keller Williams ( # 18 out of 100 ) as the brand of Global High Level Franchising . Forbes named Keller Williams (No. 6 out of 300) as one of the " Best Employers for Women ". The Franchise Business Review has named Keller Williams as Top Franchise for Women. Our real estate consultants are focused on competing like never before. They are taking advantage of our technology to continue to outperform the market and gain more territory even in the midst of the market changes we are witnessing. - said John Davis. As of September 30, KW had 166,854 real estate consultants in the United States and 3,276 in Canada,. Consultants closed 306,243 transactions during the third quarter of 2018, an increase of 1.9% over the third quarter of 2017. Consultants closed $ 93.5 billion in sales volume, an increase of 4.2% over the previous quarter. Consultants registered 195,813 new fundraising, an increase of 4.4% over Q3 2017. These revenues amounted to US $ 66.1 billion, an increase of 12.7% over Q3 2017. The consultants signed 320,689 contracts, an increase of 1.0% over the 3Q of 2017. The volume of contracts per deed was US $ 96.2 billion, an increase of 3.0% over Q3 2017. As of September 30, consultants closed 842,186 transactions, an increase of 3.5% in the first nine months of fiscal year 2017. Consultants closed $ 256.5 billion in sales volume, an increase of 7.5 percent over the same period in fiscal year 2017. Consultants recorded 598,720 new fundraisers, an increase of 6.7% over the same period of fiscal year 2017. Revenues totaled $ 206.7 billion, an increase of 15 percent over the first nine months of fiscal year 2017. The consultants signed 947,867 contracts, an increase of 3% over the same period of fiscal year 2017. The volume of contracts signed was $ 287.6 billion, an increase of 7.1% over the first nine months of fiscal year 2017. As of September 30, KW had 7,199 consultants outside the US and Canada. Consultants closed 6,979 transactions in the third quarter of 2018, an increase of 46.9% over the same period in 2017. Consultants closed $ 1.1 billion in sales volume, an increase of 31.2 percent over the prior period. The share of Global Growth Share increased 43.7% over Q3 2017 to $ 503,270. The consultants raised 18,990 new properties, 41.9% above the third quarter of 2017. Revenues totaled US $ 5.6 billion, an increase of 12.5% over the third quarter of 2017. The consultants signed 8,443 contracts, an increase of 43.1% over the third quarter of 2017. The volume of contracts in writing was US $ 887.8 million, 29.3% higher than in Q3 2017. The consultants closed 19,655 transactions in 9 months in fiscal year 2018, an increase of 54.3% over the same period of fiscal year 2017. Consultants closed $ 3.3 billion in sales volume, up 54.0 percent from the first nine months of fiscal year 2017. The share of Growth Share increased 64.2% over the same period in fiscal year 2017 to $ 1.5 million. The consultants raised 53,050 new properties, an increase of 55.0% over the same period of fiscal year 2017. Revenues totaled $ 16.7 billion, an increase of 50.2 percent over the same period in fiscal year 2017. The consultants signed 22.577 contracts, an increase of 49.9% over the first nine months of fiscal year 2017. The volume of contracts signed was $ 2.7 billion, an increase of 48.2 percent over the same period in fiscal year 2017. Outside the US and Canada, Keller Williams Worldwide's 34 regions include: Argentina ; Belgium ; Belize ; Bermudas ; Cambodia ; Colombia ; Costa Rica ; Czech Republic ; Dubai-United Arab Emirates ; France ; Greater Shanghai , China ; Greece ; Indonesia ; Israel ; Jamaica ; Luxembourg ; Mexico ; Monaco ; Nicaragua ; Northern Cyprus ; Panama ; Philippines ; Poland ; Portugal ; Puerto Rico ; Romania ; South Africa ; Southern Cyprus ;Spain ; Trinidad and Tobago ; Peru ; United Kingdom ; Ireland and Vietnam . Keller Williams, headquartered in Austin, Texas, the largest real estate franchise in the world, has more than 980 Market Centers and 190,000 associates. The Franchising Real Estate brand is number 1 in number of transactions and sales volume in the United States. In 2015, Keller Williams started the evolution for a technology company and today is responsible for the development of a real estate platform that deserves the preference of buyers and real estate consultants. Since 1983, the company has cultivated a technology-oriented, training-oriented agent-centric culture aimed at maximizing the financial return of real estate consultants working for Keller Williams.